There are many so-called spiral galaxies, which are called so precisely because of its shape, spiral. 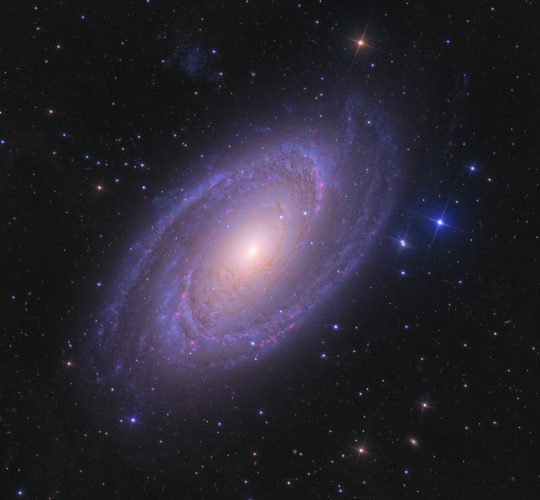 The M81, in the image, is one of the most famous simply because it is one that more shine. Easily findable in the night sky as it is in the Big Dipper, Galaxy Bode (c’mon, M81) stands out for its large yellow center with a black hole. With around 300 000 stars it is of a size slightly less than the galaxy where we live (the Milky Way) and is located about 11.5 billion light years from here. Remember that a center with large black hole, one supermassive (called) makes the gas that orbit around it becomes hotter (by gravity), more shine and emit more electromagnetic energy. Therefore, it is felt that in the center of this galaxy may be a quasar, we, a source of electromagnetic emission and bestial, a source of quasars is a black hole. Remember called quasar to any source of emission of electromagnetic energy and this can be due to many things, but usually a black hole.